The sE2200a II Multi-Pattern microphone is the latest in sE Electronics’ lineage of sE2200 condenser mics dating back to the year 2000 (sE2200 > sE2200a > sE2200a II); a mic which has been by far sE’s best-selling model over the past decade. The sE2200a is the UK’s best-selling studio condenser microphone and has won pretty much every major award around the world for performance to price point, including an unprecedented twice winner of the coveted Music Industry Association (MIA) award. The sE2200a II Multi-Pattern (launched at NAMM 2012) uses a hand-crafted, 1" gold sputtered diaphragm, based on the original sE 2200a capsule, but a 'back-to-back' version which allows for multiple polar patterns (Cardioid, Figure of 8, Omni). The multi-pattern sE2200a MKII has been designed in response to feedback from many current 2200a users who love recording with the mic and have asked for a multi-pattern version. The sE2200a MK2 multi-pattern has also been given a face lift with sE's new custom black rubber paint finish, which is both stylish and practical, helping to damp chassis resonance which many competitor microphones suffer from. April 2012 Update - The original sE2200a (cardioid only) has been given a facelift. Find out more about the sE2200a II Cardioid (also known as sE2200a II C). 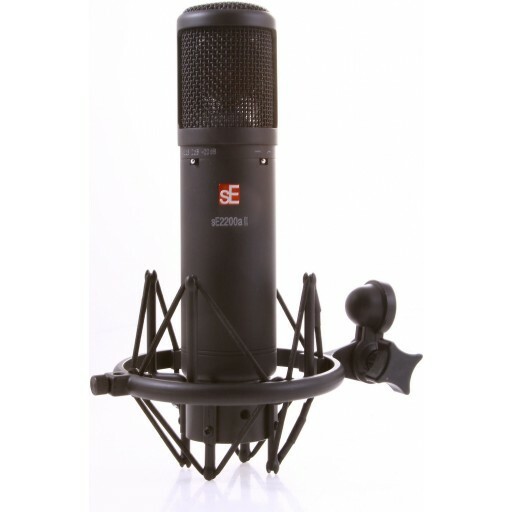 At launch (January 2012), the sE2200a II Multi-Pattern will ship with a FREE brand new, stylish black rubberised shock mount (matching the sE2200a MK2 microphone finish) and a FREE black sE Metal Pop which mounts conveniently on the shock mount, or can be removed for convenient instrument mic'ing. It is highly unusual for a mic series at this price point to be used in so many professional studios, and at such a high level... that's because, like all of our mics, the sE2200a and now the sE2200a II Multi-Pattern, have been built to the standards you'd expect from the top 'boutique brands' like Neumann, but cost only the same as the mass-automated produced microphones from other well-known brands. One of the most influential recordings of recent times, Amy Winehouse's 'Back to Black' Album, featured lead vocals from Amy using the sE2200a throughout... as did the more recently recorded multi-platinum album from Ellie Goulding 'Bright Lights' and many others. At sE Electronics, we look forward to hearing your recordings with the sE2200a II Multi-Pattern.